By now you’ve all seen it, right? 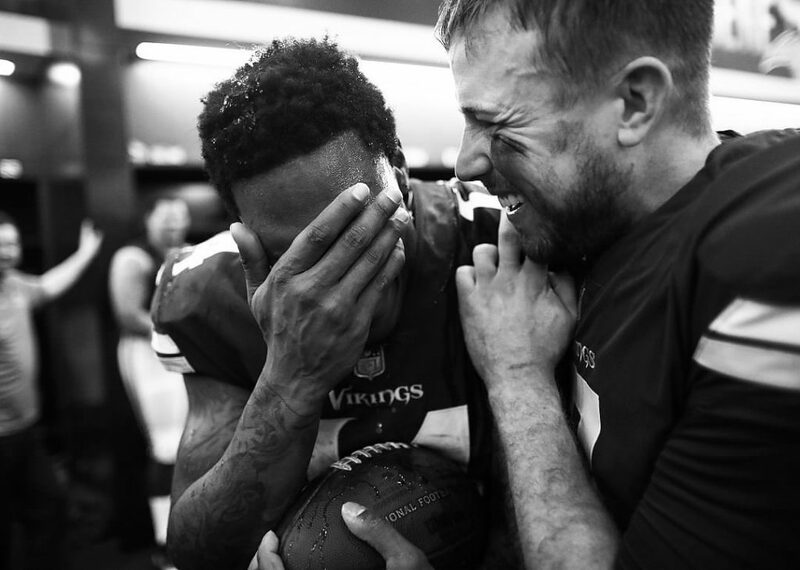 Last night’s last ditch pass from Vikings quarterback Case Keenum to wide receiver Stefon Diggs, resulting in a game-winning touchdown in the last 10 seconds of the game. They’re calling it historic, legendary, the Minneapolis Miracle. Things like this just don’t happen… until they do. And when they do, we all — sports fans or not — lose our minds. We scream. We jump up and down. Kids light up and grown men cry. We can’t believe it — but look around. Everyone else saw it, too! We confirm the good news to each other with grins and hugs and tears and cheers, and wake up the next morning shocked and hoarse and happy. My favorite genre of film is the DISM: the Disney Inspirational Sports Movie (trademark: me). If you want to see me cry, turn on The Rookie or Miracle. If you want to see me bawl, it’s Remember the Titans. I even loved the one about cross country, for crying out loud (McFarland, USA). These stories are about the underdogs, the impossible dream, the ragtag group of far-shots that band together to do something bigger than any one of them could have done alone. The very best part of every one of these movies is the montage. You know what I’m talking about — the two-minute compilation of short scenes spliced together in order to save time while still showing progress. There’s usually an up-tempo song playing in the background, advancing the story but sparing the viewer any quotidian details — because daily tasks, even the ones that ultimately lead to victory, tend to be unsexy. Remind me of this tonight when I put in my nightguard. Anyway, I think this is why I loved Michael Phelps’ commercial for Under Armour. It aired during the 2016 Olympics in the midst of him winning all of those gold medals, serving as a reminder that his glory was only a result of all of the hours of unseen work. Listening to interviews with the Vikings after last night’s game, they confirmed that this was a play that they’ve run over and over in practice. They put in the work, not knowing when or where they might need it — but when that moment came, they were ready for it. To borrow from the Phelps commercial, it’s what they did in the dark that put them in the light — and whether or not we’re professional athletes (I’m basically positive that no one reading this is — no offense, dear reader), I’m pretty sure this is inspiration we could all apply to our lives in some way or another. Twenty four hours later, my social media feeds are still all purple. I’m thrilled for my many longsuffering Minnesotan friends, and am pulling for the Vikings to be in the Super Bowl at home — something no team has ever accomplished — in just a few weeks. Until then, you can find me here, hanging out on YouTube, still crying. Brilliant, Annie! You captured the moment. . . as unbelievable as it was! This singular event renewed hope and faith!!! Thank you for you eloquence!!! Give Foxy a big hug for me, also!!! MISS you, Sweetie!!! YES. Keep writing, Annie P.
Yup! This is a huge part of why I loved cheering so much!! There are loads of sweaty sessions behind the scenes for 2 minutes to perform, and it was all worth it. Plus rooting on the teams and players personally was fun! Thanks for this share ???? “Remind me of this tonight when I put in my nightguard.” I laughed so suddenly, I almost spit La Croix through my nose. You are the best. “my nightguard” Oh thank you for that laugh! I’m dead. The Celine music vid. Genius.